Ann is currently accepting commissions for Completion for completion July 2019. Ann's program of workshops is available here. £1.75 including envelope. Click here for cards. Original works for Sale - click here! Prints for Sale - click here! Limited editions of photographic reproductions of Ann’s original work. Please phone or email Ann if you are interested in making a purchase. Some Prints and Original Works regularly sold in the Gallery. ** subject to any sales made recently. Ann's studio is at Haddenham Galleries, 20 High Street, Haddenham, CB6 3XA. The studio is in the main building, and is accessed directly from the car park. Visitors are always welcome at the Studio and Gallery. There is a location map on the Haddenham Studios website; this can be reached off our links page. Plenty of parking on site. Haddenham Galleries has a tearoom selling coffees, teas, cakes, and other snacks. 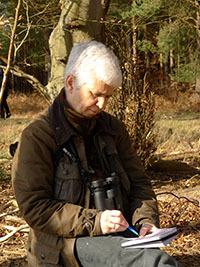 Ann is a professional artist and illustrator of some 30 years experience, specialising in wildlife and natural history subjects, working mainly in watercolours. She graduated from the Cambridge School of Art and has been working freelance ever since. Many of Ann's paintings reflect her interest in watching and recording the wildlife she sees around her. Many weekends Ann heads for the countryside to collect more sketches and ideas for work, and the bird reserves of Norfolk and Suffolk are frequent destinations. Her pictures hang on walls as far away as Japan, and her illustration work has appeared in publications by the BBC Natural History Unit, the Worldwide Fund for Nature, the Countryside Naturalists Trust, and many others. Ann also teaches local art groups and runs occasional workshops, and she is also in demand for face painting at f�tes and children's parties! without written permission of the artist. Website design � Ann and Andy Biggs. The site is hosted by Easyspace, whose policy in this regard may or may not be the same as ours.